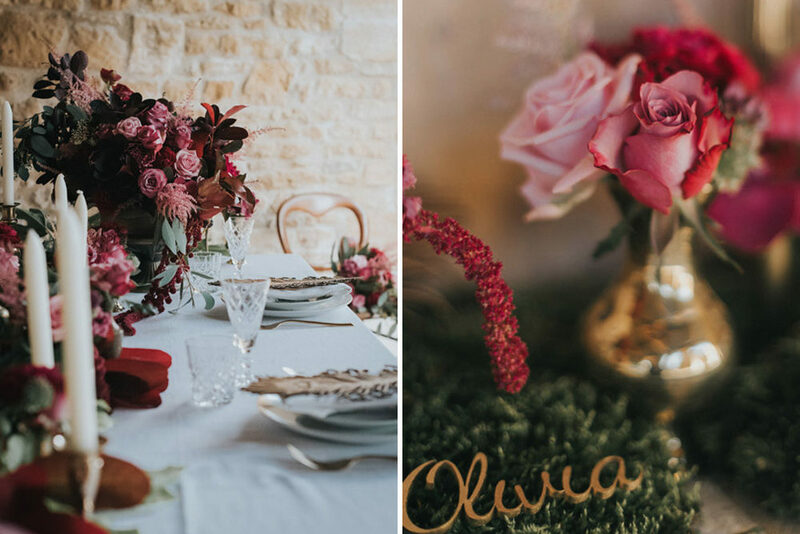 This morning’s inspiration shoot comes from two fabulous wedding suppliers from our handpicked directory The Love Lust List. 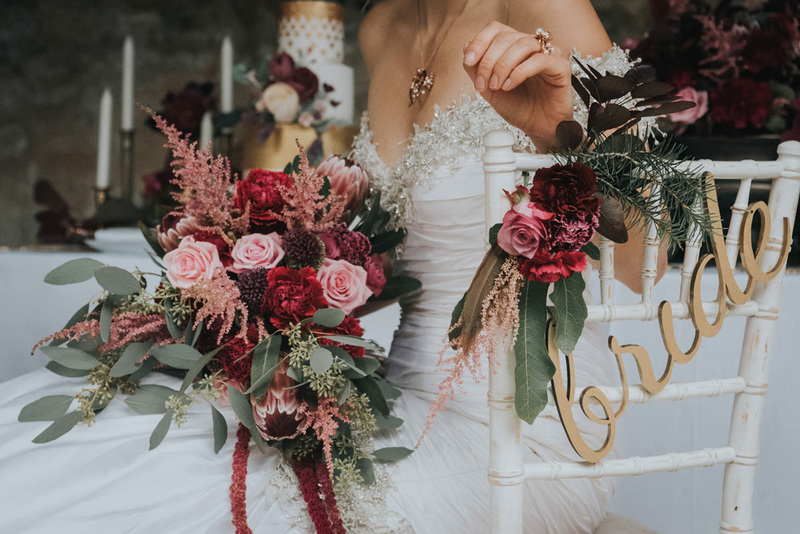 Both Hollie from Daisy Says I Do and Esther from Flower Style Co. are very talented ladies and the styling and flowers in this shoot are just gorgeous. The country refinement theme is perfect for Cotswolds wedding venue, The Barn at Upcote. I don’t think I can think of a place in the UK that suits the theme more! 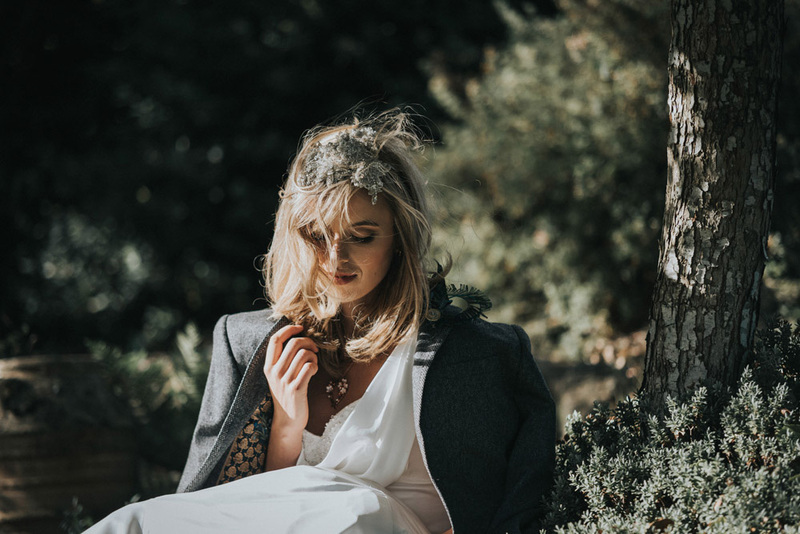 Holly from Daisy Says I Do: Having worked with Sheryl from Ooballoos Wedding Photography before I was excited when she asked me if I would like to style an inspirational shoot that she was working on, I love her style of photography and the emotion she portrays in her images. We developed the concept; a refined country theme with a luxurious colour scheme of rich pinks and reds. The Barn at Upcote provided the perfect backdrop for the shoot with a combination of beautiful Cotswold countryside, exquisitely renovated barns and unexpected vistas with every turn, needless to say Sheryl was in her element. 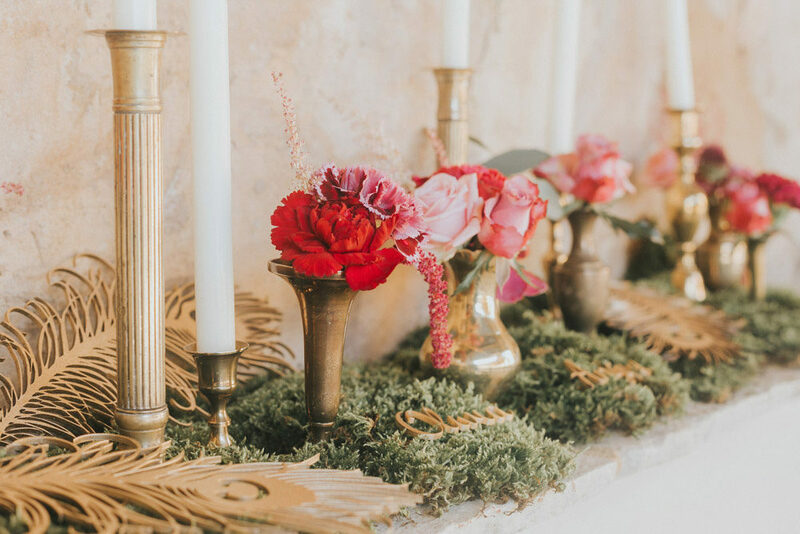 The gently changing autumnal colours in the trees reflected in our gold details and added a subtle rustic accent to our shoot and contrasted our rich scheme of reds. At Daisy Says I Do we create bespoke pieces and décor schemes whilst also coordinating other suppliers for a cohesive style. The refined country style inspired the use of pheasant feathers which were incorporated throughout along with glimpses of tweed. The scheme of rich pinks and reds were complimented with gold which was added in many of the details. The luxurious brushed gold cutlery for the place settings was supplied by The Cutlery Commission and was echoed in the gold rimmed crockery and our gold peacock feathers, the textured white linen napkins and white table cloth kept the style clean and sharp. Truffles from OmMazing Chocolates (which were delicious by the way) made favours for the photoshoot and we displayed them with Daisy Says I Do bespoke place names. 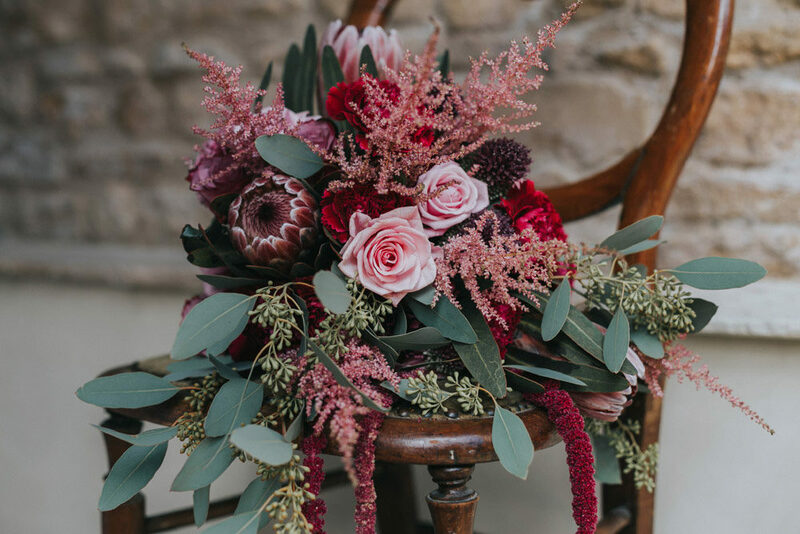 Fellow Love Lust List member Esther from Flower Style Co. created stunning floral arrangements using luxurious and varied textured blooms in a range of brass vessels of different sizes from Daisy Says I Do’s collection creating both a delicateness and pockets of bold colour. The foliage was from a little foraging mission from a local country estate which we gathered (with permission of course!) 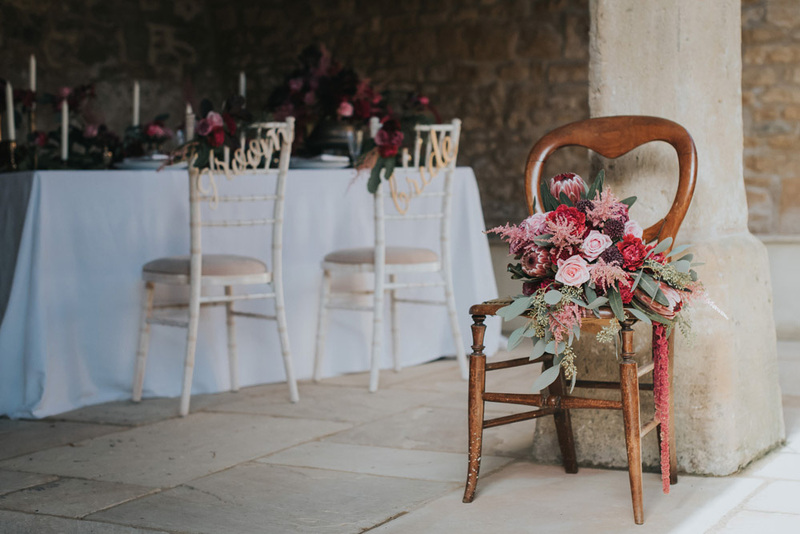 We nestled Esther’s gorgeous arrangements within the foliage we had collected and added pheasant feathers and an eclectic mix of Daisy Says I Do’s brass candlesticks and crisp cream elegant candles. 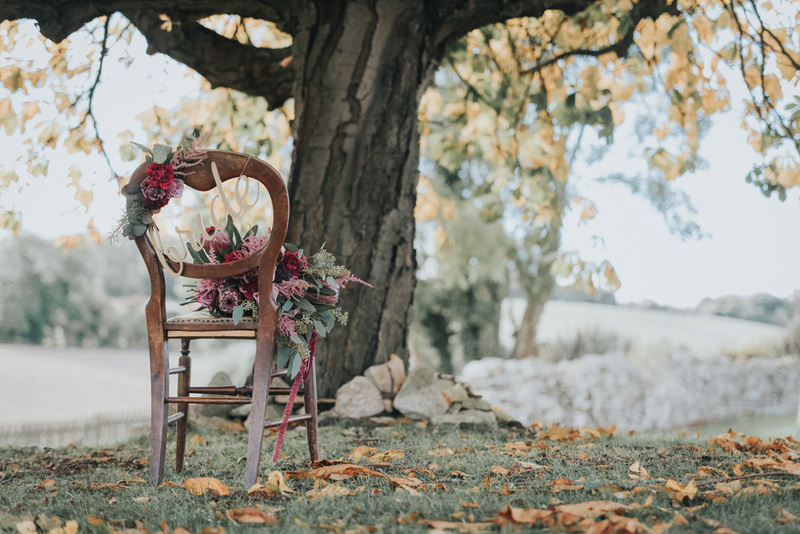 Working closely, we combined the props and bespoke details that I had made for the shoot seamlessly with Flower Style Co. flowers including gold Bride and Groom chair backs and peacock feather place setting details which added a personal touch. Anna at Sugar Bowl Bakes created a stunning four tier white and gold opulent cake with a sugar craft flower spray in our colour scheme, it looked stunning with both a floral backdrop and contrasting against the rustic barn when we positioned it on a window ledge; perhaps not your usual cake location but the juxtaposition was interesting. The personalised cake slices from The Cutlery Commission in both rose gold and silver were an exquisite addition to our shoot. Our gorgeous model Kristi Flower epitomised elegance with a show stopping Cali Bride hat over veil designed and created by LVH Millinery, the statement piece was beautifully balanced by the gown: Brunei by Ian Stuart with its off the shoulder, beaded neckline and dramatic silhouette; provided by Wedding Days of Cheltenham. The soft wide ‘v’ neckline framed the Shaun Leane cherry blossom diamond, pearl and rose gold necklace from Beards in Cheltenham along with a beautiful matching wedding ring. A vintage French fur mirrored the autumn colours of the surroundings and the whole look was finished with the most luxurious bouquet including a variety of roses, protea, orchids and astilbe by Esther from Flower Style Co.
Kirsty Caudell created flawless makeup which looked beautiful with both bridal looks created on the day, Holly Parkinson from Blushes Cheltenham created two hairstyles that perfectly suited the overall style and the LVH Millinery pieces and was on hand to make adjustments. The second of the looks was perfect for an elegant evening reception with an unstructured hair down style with a beautiful tiara from LVH Millinery called Pearl Bride. A bead embellished gown by Maggie Sottero called Greer from Wedding Days of Cheltenham skimmed Kristi Flower’s figure creating an effortlessly stunning look. A bolder Shaun Leane earring was added to take the look from day to night ready. 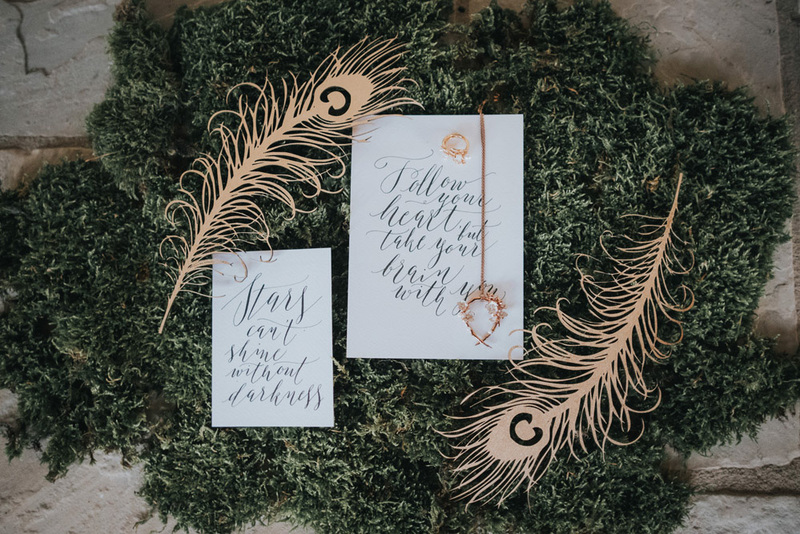 I love creating little detail set ups and incorporated calligraphy stationery from By Moon and Tide, pheasant feathers and tweed to display both the jewellery and the statement Bullet Brooch by LVH Millinery which with its rich turquoise feathers contrasted with our colour scheme. 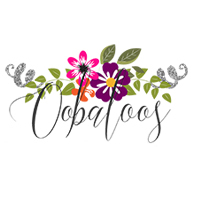 Natasha Ewins also from Oobaloos Wedding Photography, captured behind the scenes footage of the décor and style coming together, there was a great atmosphere with wonderful suppliers which these images depict. Sheryl captured the details, the set up and our model in this stunning collection of images that we are all thrilled with! Sheryl and Kristi finished off the shoot by making the most of the golden hour autumnal light and playing creatively. I am excited for our next project which is never too far away. Despite everyone’s hard work, Nell the puppy definitely stole the show and gave a playful element to the shoot. I love seeing galleries from weddings where a family pet has been part of the day and Nell certainly upped the cute factor! Floral Design Flower Style Co. Tags:Autumn wedding |The Love Lust List |Daisy Says I Do |Flower Style Co.